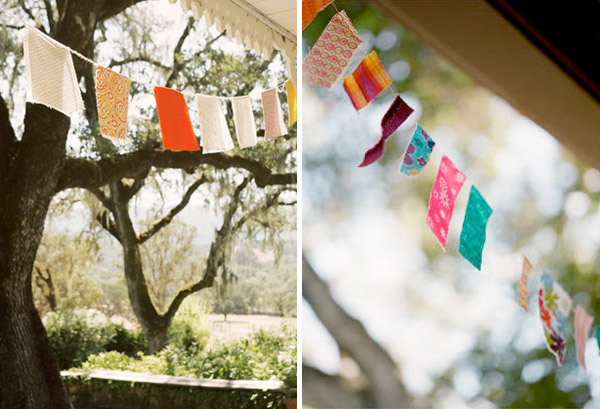 *Orange Yellow and Peach lanterns, Martha Stewart, Doily Bunting, EmmalineBride.com, Doily Table Runners, EmmalineBride.com. For a more rustic affair, I’ve picked out two different takes on doilies. First up, the traditional lace kind, sewn together to make runners – a really rustic vintage addition to tables, particularly long trestles, although I can totally see these re-worked for a round table set up too. 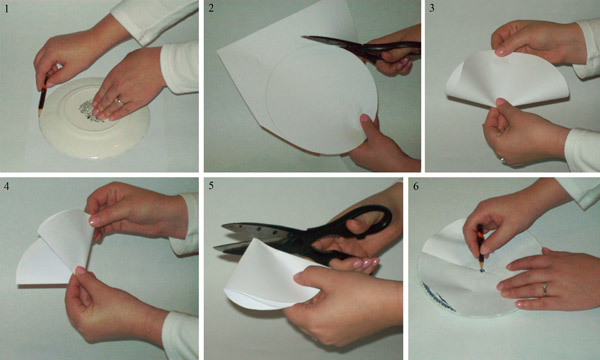 And for what must be the cheapset bunting ever, that still looks really sweet and could be made in any colour, how about using paper doilies strung together in this super simple DIY? 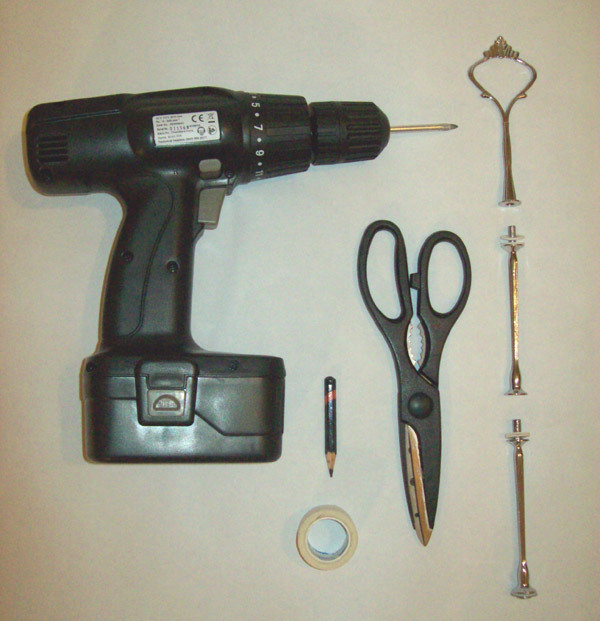 Are you DIY-ing this weekend folks? Without fail the best days at Rock My Wedding HQ are the days we get thanked. We love your comments in the comments box below, (they come a close second,) basically we just like to hear from you! I just wanted to email you girls before I head off to get married in Australia on the 13th of November. I’m a Tasmanian girl who moved to London in 2008 to do my masters in Fashion Journalism, but along the way fate intervened, I met Mr S, and after a heartbreaking 9 months of long distance due to visa issues (in essence, my visa was shorter than the length of my course and the law changed so I was pretty much deported…) he proposed on Boxing day last year. In his words – ‘I wanted to do it as soon as you were back on Scottish soil’ because he’s a Glasgow lad and we were there for Christmas. In his rucksack (he’d dragged me up a mountain in the snow) was a bottle of champagne, now frozen, and the tiffany schlumberger platinum, sapphire and diamond band I’d spotted in Selfridges months before we’d even talked of marriage, while buying a present for someone else. Come January there I was, back in London, staring at my beautiful new ring, miles away from family and friends at home, and Mr S sprung on me that he’d booked the cathedral where my mother and father, and both sets of grandparents, were married. For the 13th of November. As in, within 11 months. And we weren’t going to be back in Australia before then, but surely it wouldn’t be a problem for me to plan a wedding? From here? I’m blessed with a tight knit, lovely, ‘call in the middle of the night, ask them to do anything and they will without asking why’ group of girlfriends here in the UK but I’m not only the first to be engaged, I’m really the only one who’s even remotely at that stage. So much as they all joyously congratulated us, showered us with well wishes and love, and all offered to do anything they could – no-one really knew what that ‘anything’ was going to be. There was no ‘go-to’ gal who’d weathered her own wedding before to reassure me when the planning went awry, and as I lost my mum to cancer when I was 4, I didn’t have her support either. 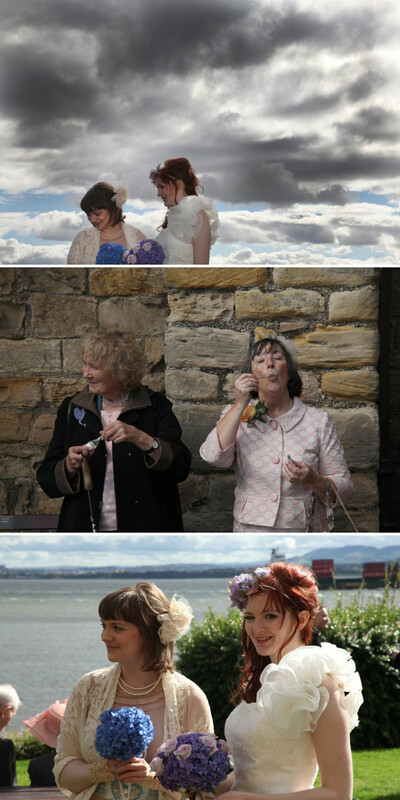 I wanted our wedding to be very DIY, not slick or formal – basically a repeat of like we had our school leavers deb dance – everyone there was in black or red strapless gowns and I wore a green and pink floral number and pimped out my shoes with ribbons. Mr S really wanted to be married in 2010, for a number of reasons, and put it to me so sweetly and so heart-thumpingly romantically that he didn’t want a long engagement because he wanted me to be his wife for as much of his life as possible, that I agreed. I mean, he’s from Glasgow. Those guys aren’t renowned for flowery prose. I decided on a floral-y, art-deco-y type theme, and after a myriad of disasters, we get on the plane next Thursday to fly out to Hobart – arriving a week before the big day to organise the final details. I’ve just looked over this email and it’s massive, for which I apologise and hope that you two are schooled in skim-reading. The reason I wrote was to thank you both, so much, for Rock My Wedding. It has been the ‘clued up wedding girlfriend’ I’ve needed, and I check it, religiously, every day. 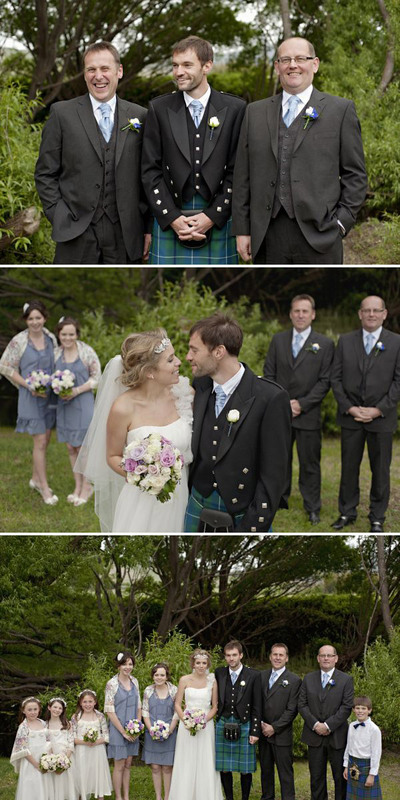 I actually cried when Jenny married Duncan from blue. It’s been like reading notes from a big sister with the exact same taste who has done it all before, and I don’t know how I’m going to wean myself off it once I am Mrs C-S. Thank you girls, really. I probably won’t get a chance to thank you in my wedding speech, but then again, I just might. I always knew I had the perfect man in Mr S, and RMW has helped a lot in planning what may not be the most perfect wedding the world has ever seen (or even of a comparable RMW standard) but will be utterly perfect for us. I am Gemma and I am a self-confessed RMW addict. It actually became a bit of a running joke at the office where I used to work that I constantly had the website open, even if it was sneakily minimised in the corner of my screen. Raymond and I were married on the 13th of November, 2010. Despite the fact that we met and were living in London, Raymond is Scottish and I am Australian, and we decided to get married in my home town of Hobart, Tasmania. One of my biggest pre-wedding fears was that I’d have a bad breakout and I really wanted a fresh, natural look that I didn’t think I could manage myself, however as we flew in just a few days before our wedding, I didn’t have time to do any trials and my original hair and makeup artist fell through. Enter Rosa, whose business is called ‘Simply Flawless’ – and she was. She gave me a makeup trial the night before, called in another hair and makeup artist to help with my maids and family, and managed to do the full makeup for another wedding in the morning before coming to ours. Once I had the dress, I wanted an art-deco style headpiece, but I didn’t want it on a headband, and I didn’t want a ‘tizzy’ tiara. (I wanted to look like an Alphonse Mucha girl, not a my little pony) I nearly gave up and then I saw it on Glitzy Secrets – exactly what I had been searching for high and low, and sold out. I looked elsewhere for similar things but nothing matched up and so one day on a whim, I called the Glitzy Secrets phone number. The lovely man who answered told me that, in a stroke of complete and total serendipity, there were 3 of the sold out headpiece I wanted, coming back to the GS headquarters that very afternoon. He said they’d be up for sale on the website at 5pm that night, and that they’d been very popular, so it was first come first served. From 4.30 onwards I sat at my desk at work, credit card in hand, clicking ‘refresh’. At 6 minutes past 5 I had the perfect headband in my shopping cart . When it arrived, it was very art deco and vintage, so much that it was too heavy to pin into my hair! I ended up weaving thin strands of pale blue, pink and beige ribbon together and winding it through so I could get my hairdresser to tie it in my messy updo. My dress was Maggie Sottero destinations, style RD1044. I bought it from Sarah Louise Bridal in Glasgow, and found the girls there very helpful and understanding – they worked around me because they knew I had an 8 hour ‘Megabus’ journey from London for fittings! I’ve always like Grecian style gowns, but originally I had seen a dress that I thought would be the one, and it was nothing like the Maggie Sottero. 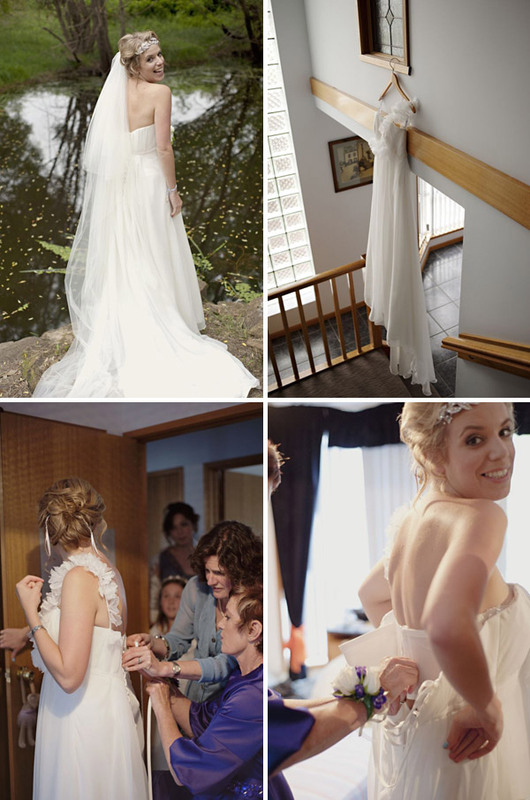 The dress that wasn’t the one was a heavy silk, structured, high fashion, Sarah Jessica Parker-esque creation from Halo Bridal in Australia, and when I finally tracked one down to try on in the UK, I looked, well, a bit like a giant piece of whitebait to be honest, and nothing like the statement bride I’d hoped to be. The RD1044 on the other hand looked fairly plain on the hanger, but once I had it on I knew it was perfect, feminine, floaty and quite timeless. Shoes for your Wedding or your Marriage? I had originally decided on Loubotin Fortitia sandals in cream. I thought I had justified the expense, and then one day had a moment of realisation of precisely what else could be done with the shoe fund, namely, quite a lot of travel and aid work in Asia: and for me it was a simple equation – the Loubotins were for our wedding day, but the aid work would be part of our marriage. My nieces-to-be, who were also our flower girls, dragged me into Barratts one day to look for their shoes, (naturally they were hoping they’d get high heels, and equally naturally, they didn’t) and I emerged with not just my shoes but shoes for my bridesmaids (my two gorgeous sisters) as well. I have to say too that the assistant in Barratts was beyond helpful, and far more imbued with the spirit of ‘wow you’re getting married that’s wonderful’ than a lot of other people in other, far more expensive and ‘geared towards weddings’ shops. 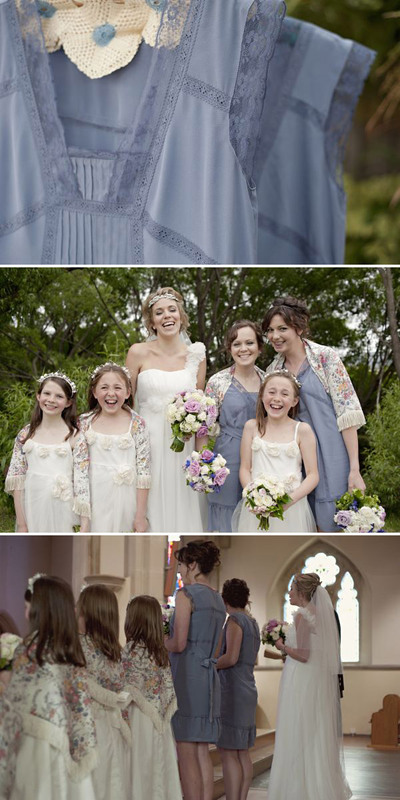 The Bridesmaids dresses came from Oasis, and were reduced to £18 in the sale! 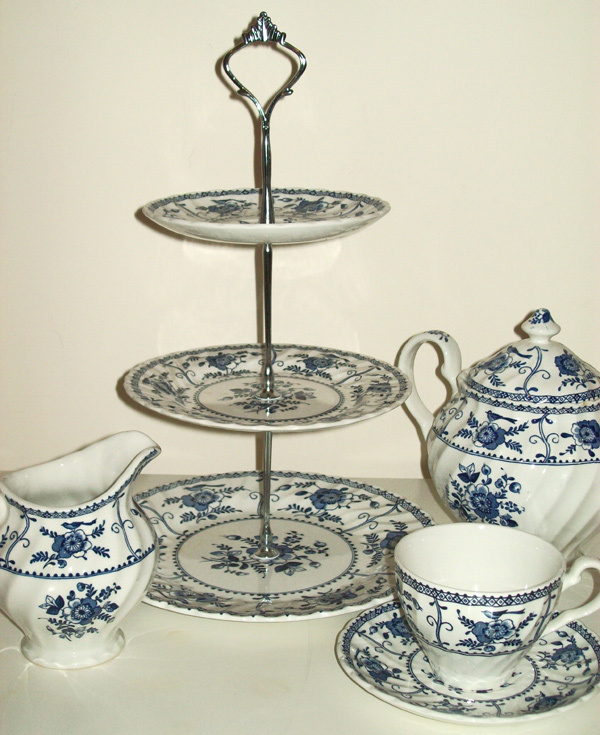 They were just what I wanted, wedgewood blue with a vintage lace trim. I ordered their headpieces from Etsy (seller Bethany Lorelle) and their shoes were from Barratts. The little flower girls wore dresses from Debenhams, and wore mismatched ballet flats due to a delivery mix up with LaRedoute. As it turned out the jumbled pastels looked better with their wraps, which we had made, last minute, the night before the wedding because we had heard the weather might turn. With all the girls with floral shawls on and the little boys in matching kilts (which we bought from the Glasgow Vintage Co. on Great Western Road) It all looked a bit like we were the Von Trapp Family singers in the cut up curtains – I loved it. If we were going to have a ‘film moment’ in the day better to have The Sound of Music than National Lampoon do a wedding – in the morning when there were 30 odd people at the house trying to get ready, I commented to our photographer that the latter was a distinct possibility! We looked into hiring suits for our groomsmen, but in the end it was easier fit and logistics wise to buy them. 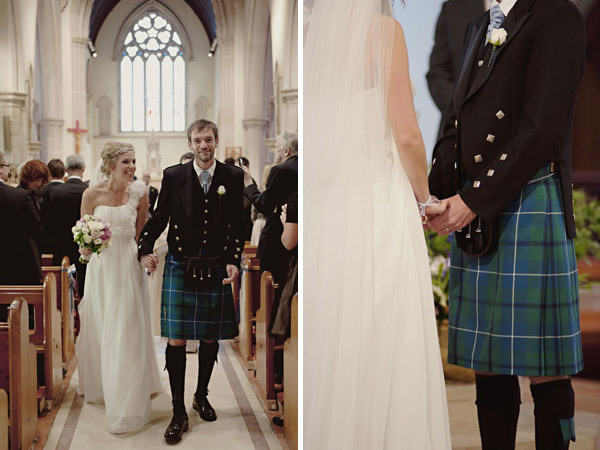 If we’d been able to hire kilts we would have, but that wasn’t an option in Hobart, and the charcoal suits from Marks and Spencers were cut beautifully and the grooms looked incredibly dapper. Raymond found some waistcoats in Uniqlo in London with a very faint red check in the wool – and both grooms also wore pale blue silk cravats the same as his which came from McGregor and McDuff in Glasgow. Raymond got his kilt, ‘Prince Charlie’ style jacket, cravat, sporran, kilt hose, flashes and shoes from McGregor and McDuff in Glasgow. He chose Ancient Douglas tartan and wore a double cuffed shirt from Zara with some cufflinks that were a present from close friends who were unable to be there. I’m going to go right out there and say it… I have never seen such a cute and amazingly styled bridal party including the little ones… I am in LOVE with those shawls! 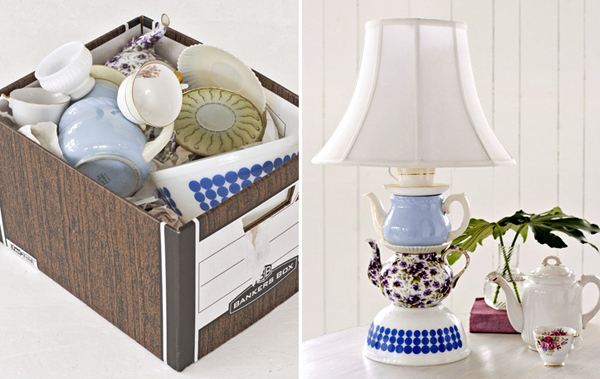 Lots more DIY and rustic-chic pretty coming right up tomorrow lovelies! The china-Doll-beautiful-dress-wearing bride that is RMW reader Linzi and her husband David had a dreamy W-day full of D.I.Y decor ( and I mean Do it Yourself people, tablecloth made of stitched together curtains bathed in tea bags anyone!?). 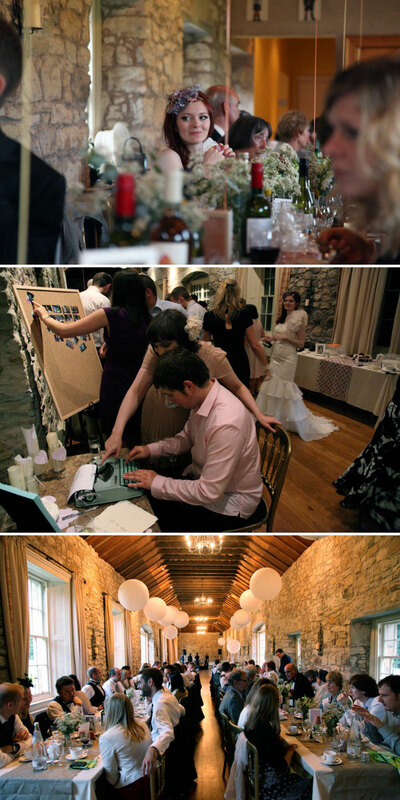 I love the slightly off-beat colour scheme and how the reception looked like so much fun…..And the balloons. You gotta love a big white balloon right? Oh and the first stormy sky shot, if that was me and my best girl it would be up on the wall pronto. Our photographer Paul is a friend of a friend. When I first started wedding planning I’d not looked into wedding photography much, I just knew I didn’t want the standard posed shots, I wanted photos that showed the atmosphere of the day that were almost like a set of film stills. Paul isn’t a wedding photographer but I could tell from his website that he had a good eye for capturing people and trusted him 100%, this has to be seen as a huge compliment to him as I have an inability to delegate pretty much anything. He took time to understand what we wanted and was really easy to work with. At Inchcolm we had a few family posed shots and a few of me and David posed, which all in all took maybe 10 minutes, our main focus was to spend the day with guests as so many of them live far away. 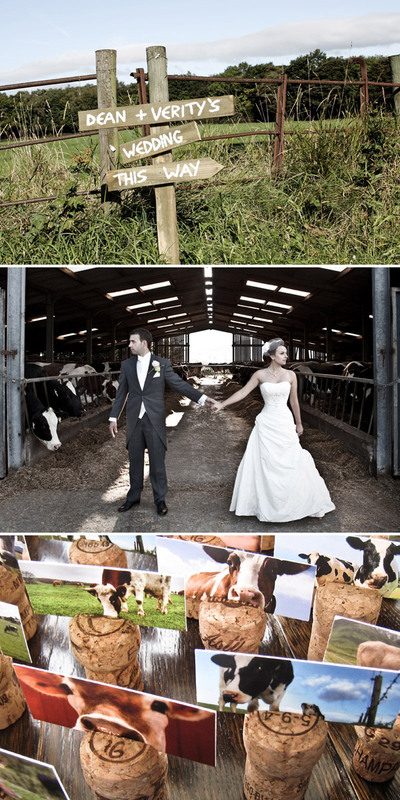 Paul’s photographs worked exactly how we wanted them-a story of the day. He stayed the entire day and we couldn’t have asked for a better photographer. When he presented us with the photographs after the wedding,I loved how he had made the getting ready shots in black and white and the rest in colour, it reminds me of my favourite movie, “wizard of oz” where everything turns to colour when Dorothy arrives in Oz and that magical music starts. 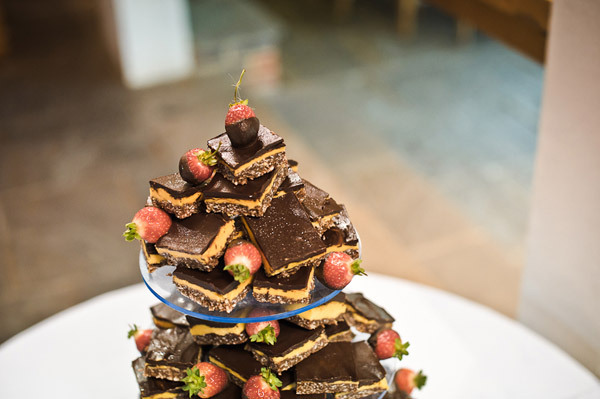 After seeing photos of American weddings with their cake or dessert buffets I decided we were going to have to have one as I would probably live off a diet of tea and cake if I could. Most of our family and friends live far away so it was up to me to do all the baking,I spent a night on the sofa surrounded by my cook books picking out the sweetest, spongiest recipes that would keep a day or two in advance. Altogether I baked 8 cakes, well, 7 after the blueberry cake sank into itself then gooped over the kitchen floor but hey…. what you gonna do about it at 11pm with no more blueberries and going delirious?!. I spent 12 hours in the kitchen with Johnny Cash on the radio and a few cups of tea inside me running what felt like a cake production line. The only disaster was the blueberry cake, which smelt amazing but was spreading slowly over the kitchen floor. In the end we had cheesecakes, honey and chocolate cake, lemon loaf, banana loaf and lots more; and i’m glad to hear that people did take a bit of each. We were still left with a fair bit which we ate on the flights to America for our honeymoon! Our main wedding cake was a 3 tier fruit cake made by by Mam who volunteered to bake it (thanks mam!) of course, she probably knew my brief would never be easy, but infact , my main concern was that I took a dislike to the standard silver cake stands and so asked mam if she’d keep an eye out for a ceramic cake stand, brown or cream, to fit the largest cake exactly! I don’t know how, but she managed to find one. I wanted the decoration of it to be simple, just ribbons, i found some yellowy mustard coloured ribbon with lace trim which I rescued from a sale box in a cake shop, we teamed it up with some chocolate brown satin ribbon, I really like how it turned out. The cake topper was very last miniature, a ring stand from urban outfitters in the form of two little ceramic bunnies, we put the cheap high street ring that David used to propose to me on one of the the bunny’s ears. 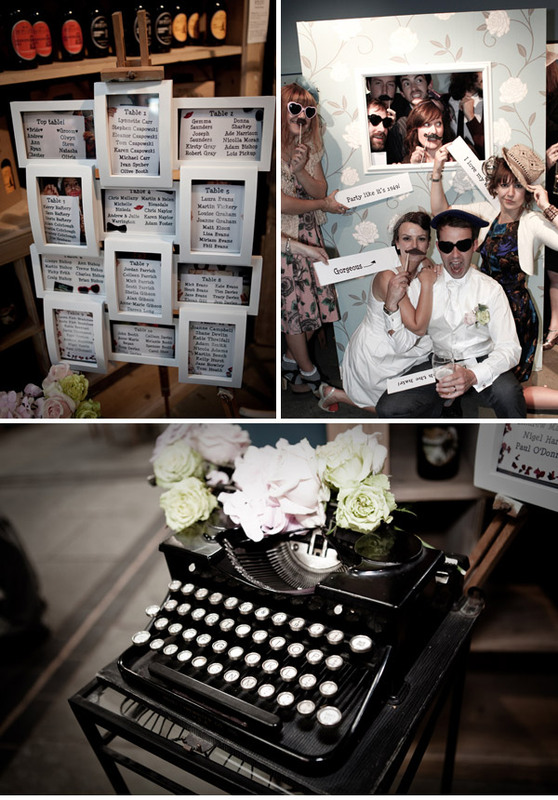 Our guestbook was a typewriter, I’d seen the idea before on wedding blogs but didn’t have a typewriter and to be honest, couldn’t be bothered searching for one. Then a few weeks before the wedding I was in a charity shop when I saw this mint green beauty of a typewriter for a fiver and had to buy it! I’m glad we did it, we got some not so traditional “letters” to us, which made us laugh when we read through them all. The photo booth/fancy dress thing may have been done 1000 times but we still wanted to do it, we set up a poloroid printer that people could hook their camera phones up to, mostly though people just put on the hats and glasses while ceilidh dancing which made for better photos and was funny to watch! We wanted personal touches everywhere, me and David are total hoarders and our house is full of weird ornaments and pictures that I have rescued from charity shops and hundreds of David’s old books and prints he has collected, there was no way that we could have a minimalist house, so our wedding décor could never be minimalist either. 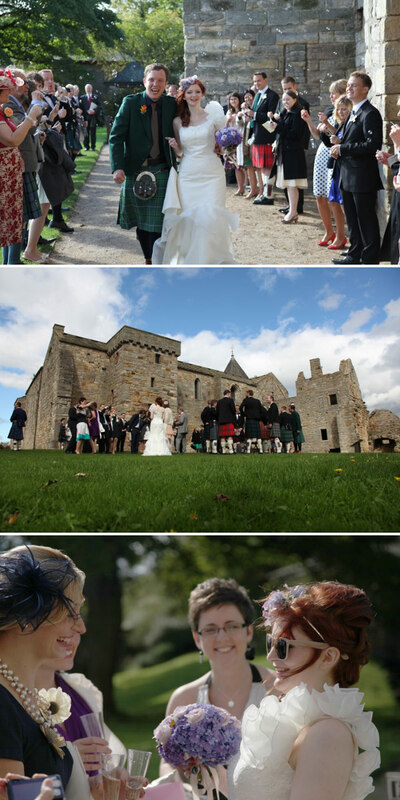 The venue at inchcolm was a long, bare room, with an arched ceiling and stone walls, the only piece of furniture was a large wooden table which was the focal point during the ceremony. I made a huge tablecloth from some Ikea lace curtains stitched together, and dyed it by filling the bathtub with water and half a box of cheap tea bags which had been lurking in the cupboard for emergencies, like when we run out of Yorkshire tea. Quite early on in the venue hunt, I insisted I only wanted to marry under natural light or candle light(not too difficult to find then, eh? bad lighting is a pet hate for me and just means more effort with make up), at Inchcolm we had both as we filled the room with tealights and church lights, I will never forget the warm scent of the candles as I walked up the staircase to the room with my dad, and now, if I fill a room with tealights I’m taken back to that moment in an instant. 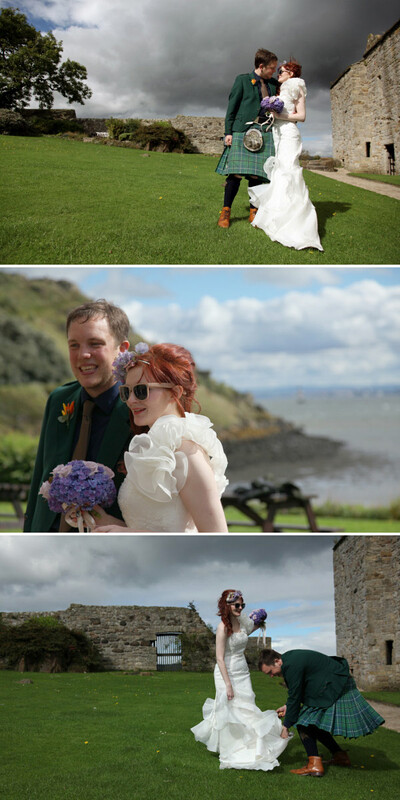 We decided to have a piper on inchcolm island, it was my dad that suggested it, and I thought that it would be nice for English guests to give them a proper Scottish experience. He piped all the guests up the abbey then came back for me, that walk from the boat to the abbey with my parents and bridesmaid was one of my favourite parts of the day. 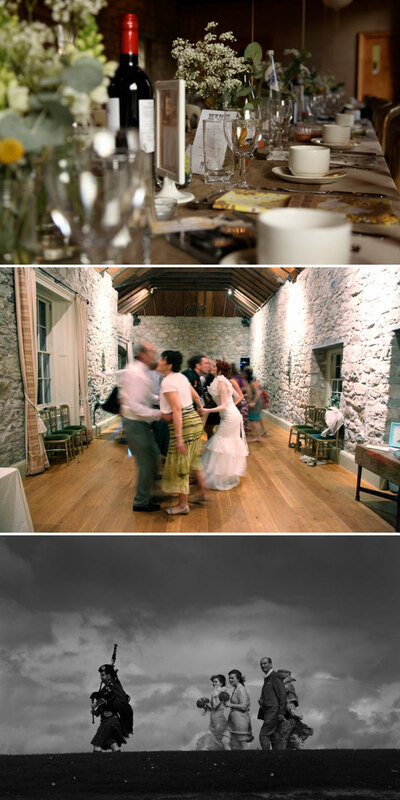 In the evening we hired the Reel Time 3 piece ceilidh band complete with piper, David loves ceilidh dancing, I find some ceilidhs a bit “folksy” and tame, so the addition of the piper really spiced things up and got everyone up dancing, we were all totally knackered afterwards! We got lots of comments about how much people enjoyed the dancing, especially the male guests! I think some men feel awkward dancing to wedding discos whereas at a ceilidh, no one really knows the steps, people fall over, everyone’s out of time, so there really is no pressure to look good….! We really should have went to some dance classes before attempting our first dance which was to johnny cash’s “memories are made of this” (both big fans of his) our practice consisted of clearing a tiny section of the floor in our study, which was overtaken with wedding décor, clothes and honeymoon packing, playing the song and deciding on moves we definitely were not going to be making (long kisses, inappropriate grabbing, any kind of elaborate footwork) and decided that would have to do. On the day, the dance was a bit rubbish really, we spent the whole 3 minutes which felt like 1 hour doing the same spinny thing and constantly saying to each other, “we cant do that one spinny move again, its getting old,” so yeah, not the highlight of the day for us! 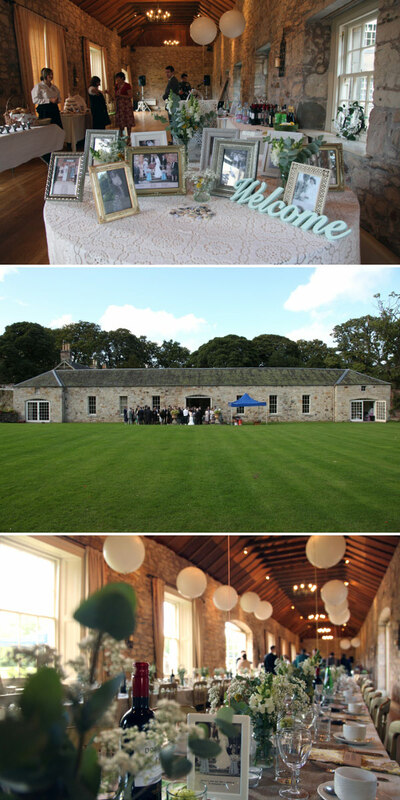 At the hall in Kirknewton, you are given complete freedom over how to set up the room, and so we booked it out for the day before the wedding to decorate it with help from my parents. We decided on long tables as it seemed to suit the room best and felt more informal as the meal was a BBQ, we didn’t want a top table as I would find it weird not having anyone opposite me, David and I sat amongst our family which meant everyone could have a good chat. We DIY’d pretty much all of the décor. I made tablecloths from cheap Ikea cotton fabric and runners from hessian, I wanted to use natural materials to compliment the stone walls and timber floor of the hall. All napkins were made from either vintage or Ikea fabrics by myself and Laura. At low level we had the jam jars of flowers and lots of tealights, we then used large white helium balloons, weighted down with tiny plant pots, to draw the eye up towards the beamed ceiling. Our table numbers were made using cheap ikea double sided photo frames, for the numbers I used a peach template downloaded from the internet, and on the other side, was a photograph of one of our family weddings, which matched the photograph on the table plan. If you’re planning on a DIY style wedding, be prepared to spend the day before arranging flowers, filling your car with decorations and surviving on supermarket sandwiches, you might not get the time to have a manicure, family meal, soak in the bath and then sit in a fluffy white robe watching a box set of your favourite TV series. Infact, your manicure might be you, sat alone in a hotel bed at 1am on your wedding morning watching coronation street repeats, hoping your nail varnish isn’t glooping at the corners because you’ve discovered that the lighting really isn’t ideal for this kind of thing, feet stuck out of the bedcovers so as not to smudge your toe nail varnish, waiting for each coat to dry and praying your hard work wont chip off in tomorrow mornings shower, and hoping that your someone will actually notice your efforts. If you’re planning a DIY wedding, all the preparation and hard work will pay off on the day, and a comment a guest makes on how much they liked the stationary/flowers/the whole thing will give you a nice feeling inside more than a professional manicure ever could. I know. I am so sad it’s over. I just want to say a huge “THANK YOU! !” to Linzi and David for sharing their Big Day with RMW and for being such an inspiration – boats, china doll make-up, blue brogues, jewellery that looks like a giant sweets…. we love. 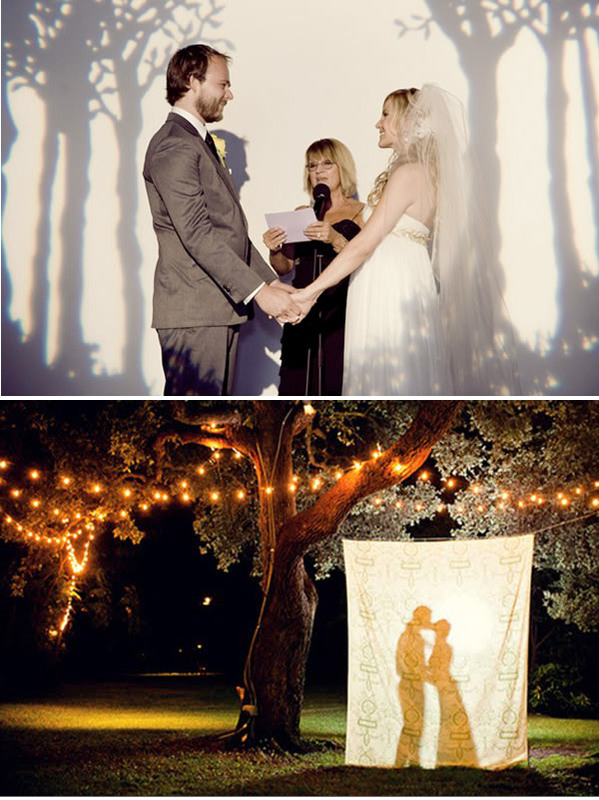 Rock My Wedding 2011 Inspiration: Whimsical, Charming and Handmade. Well good afternoon readers, happy Monday, (almost a juxtaposition, I know) and welcome to Planning Week on Rock My Wedding. We’ve paid a lot of lip service to 2011 being a new year so far and that might have been because we have been so busy planning new and exciting things for the year ahead. Once upon a time, wedding trends were long running due to the time it took to convert Real weddings to print media and the treacle like attitude to change. 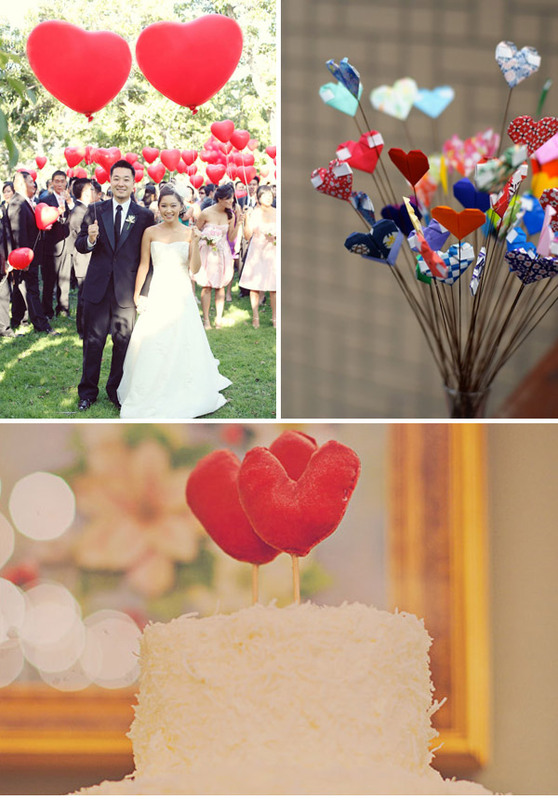 Online media and wedding blogs have changed all that and new trends are now evolving at a rate of knots. As we said this Saturday, it’s got to be your day your way, but sometimes it’s difficult to figure our where exactly you lie in the sea of inspiration thrust at Brides-to-be from every angle. It’s also difficult when you see your 100th sweetie bar to fathom how to really make it your own. 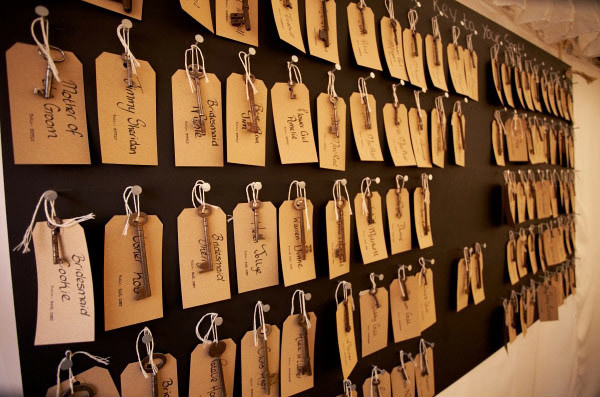 So our mission this week was to contact our favourite wedding planners for their take on inspiring you for 2011. The brief? ‘Unique, fresh inspiration‘. 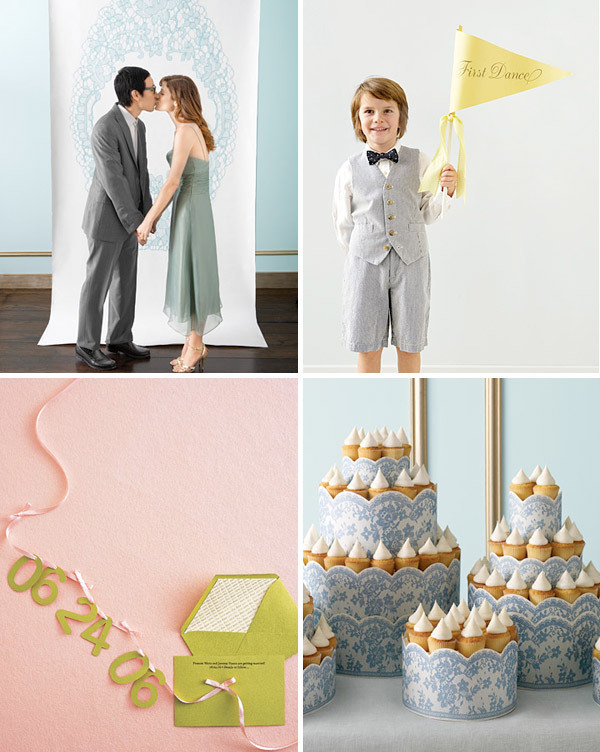 Each planner has their very own style of course, and so we’re kicking off the week with Josie from Savoir Weddings and her ideas for a Whimsical Wedding. 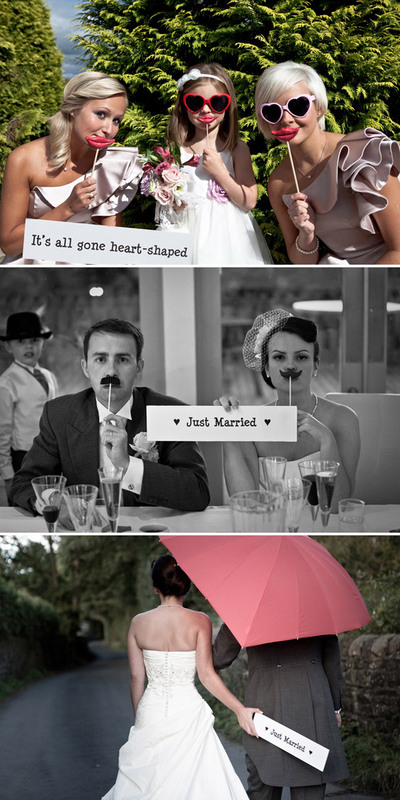 Savoir Weddings Wedding inspiration for 2011 Brides. 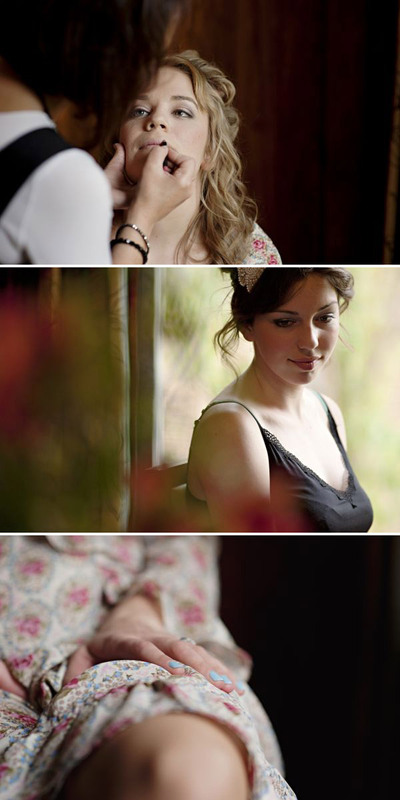 The loveliest ideas from the world wide web…. My Key words for 2011 Inspiration…? 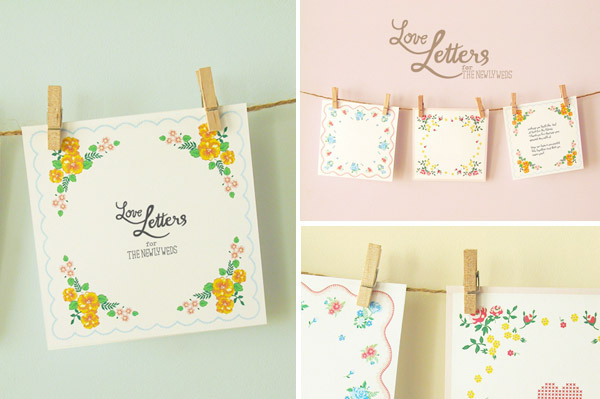 Whimsical, cute, romantic, fun, playful, charming, sweet, relaxed, and handmade. 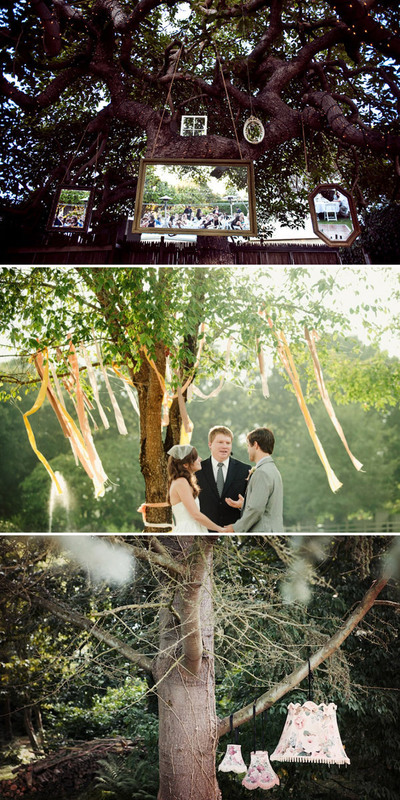 The handmade, DIY wedding is going to be even bigger in 2011 and lots of what we’ve seen in 2010 weddings will still be popular. 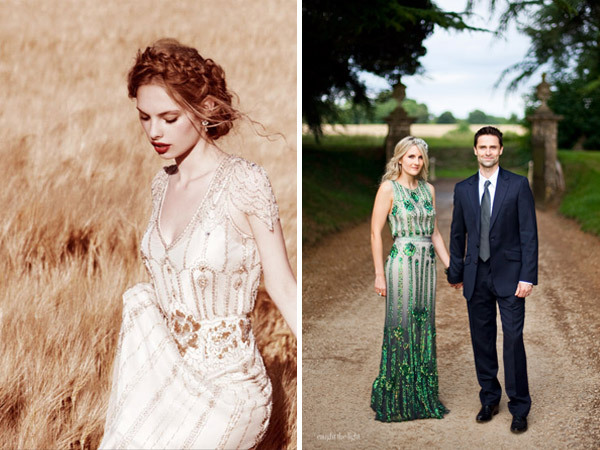 And of course, we’re still going to be massively influenced by weddings across the pond. 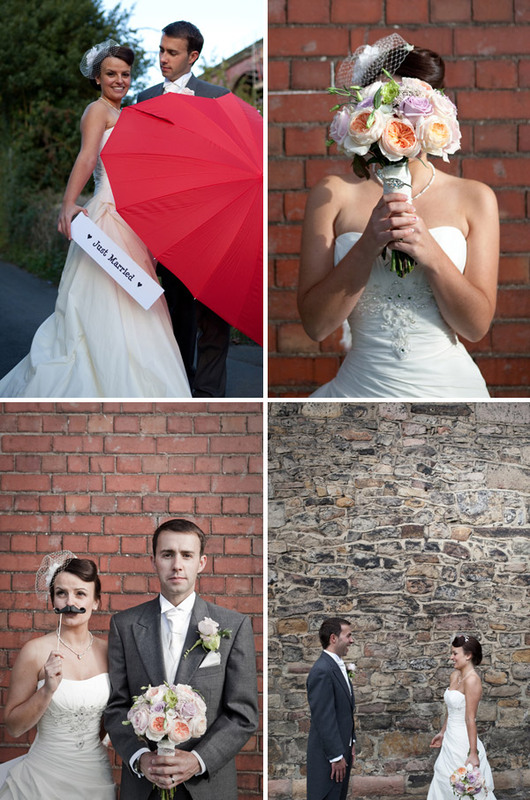 Rock My Wedding UK Wedding Blog, Images: Top, La Belle Bride and bottom. 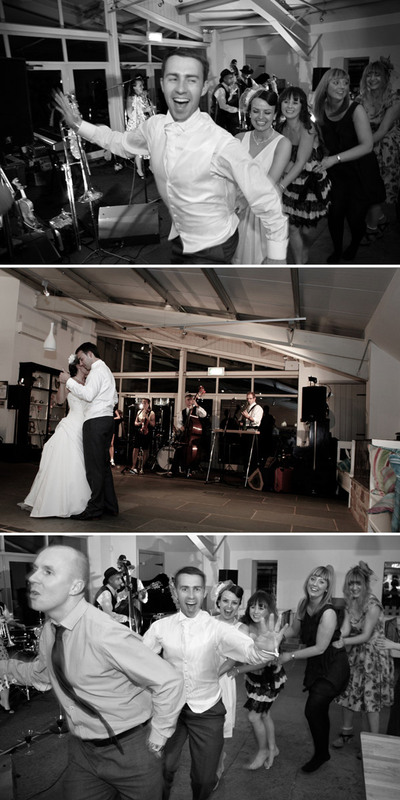 Rock My Wedding UK Wedding Blog, Image: Rock My Wedding by Murakami Photography. 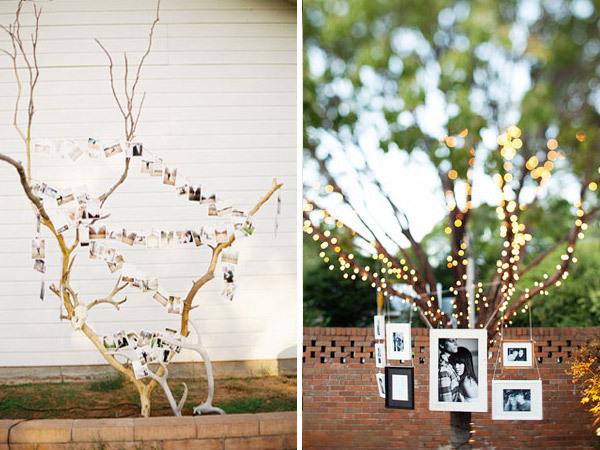 My advice for styling your wedding? 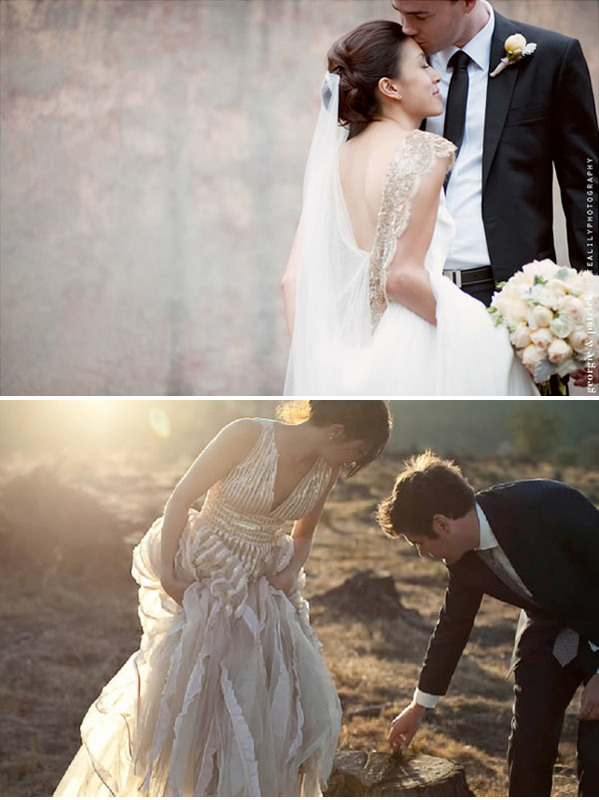 Be inspired by what you like and whether it fits your wedding, not by whether it’s en vogue or not. Because in 30 years time when you look back at your photos everything will look dated (the 80s anyone?). What won’t date is how happy you look together, and that’s the best ‘trend’ there is. Thanks Josie! 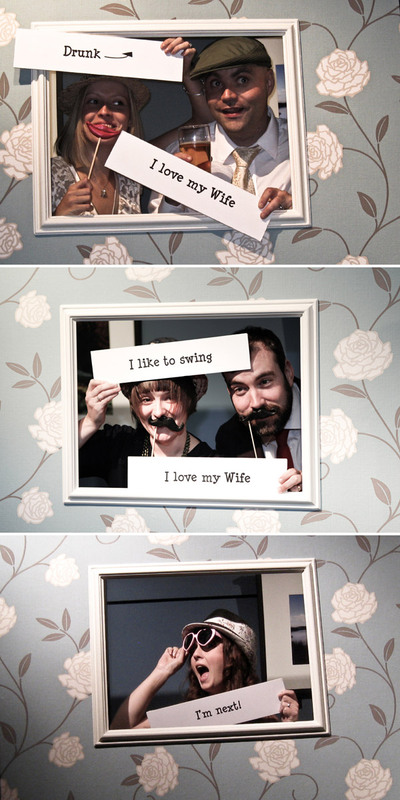 So, will you be taking any of these ideas for your wedding or have you already planned to incorporate them? 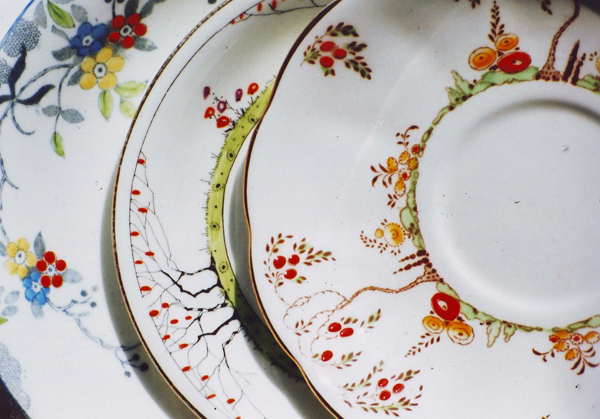 This week I have been inspired by the generosity of SophieC who won our giveaway with Idyllic Days to win Vintage crockery hire for a hen party for her friend. My thoughts turned to Hen parties of the tea inspired variety and I decided to use a couple of ideas I’ve had stashed for a while. This first one is one I actually made for my friend Laura, who was married this July – always a keen baker and lover of tradition I found this Recipe card DIY over on The Wedding Chicks and created it for her Bristol hen party. To make the home made gift more sentimental I issued each of the hens with one of these to fill in their recipe and pass on to her, kind of like a wifey starter kit ;). I have to say there was great consternation about what each hen would write, but even those who kept it light hearted provided a really sentimental keepsake – one writing a sandwich recipe they used to share at university and others passing on valued family recipes. I even passed some cards to her mum so her family members could pass on traditional recipes then presented it all in a box. 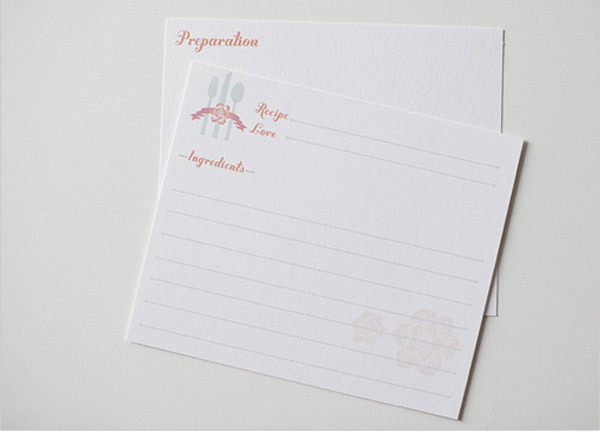 check out the full DIY Recipe cards how-to on The Wedding Chicks. 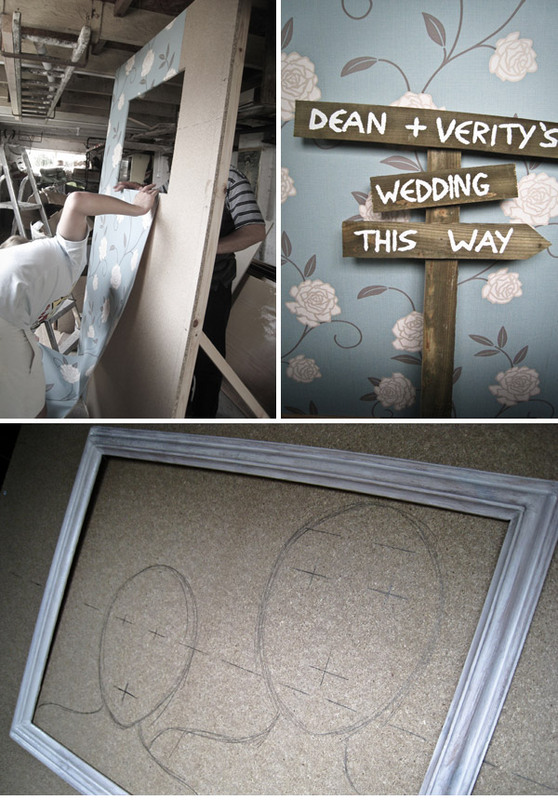 Charlotte found this little Gem and ever such an easy DIY over on Project Wedding. 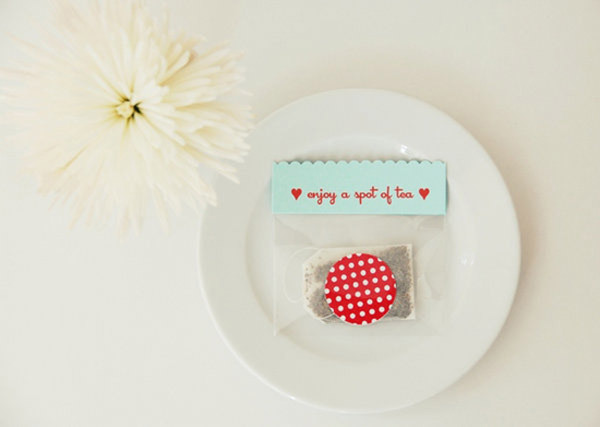 Cost effective for a tea party hen do favour, this would even be perfect for wedding favours using some fancy fruit teas. Any one with a little bit of computer or crafting expertise could whip up a suitable printable to infuse (get it?!) the day with personality and charm. 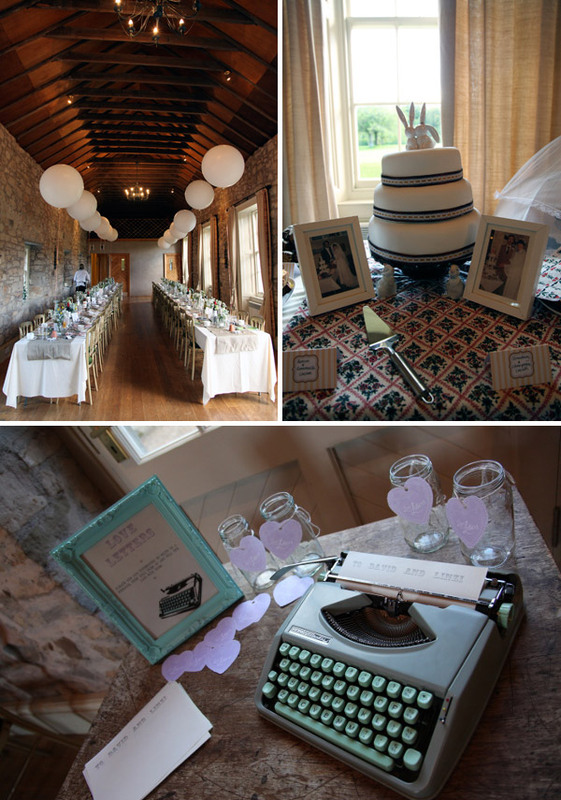 So just because we are good to you, here are some teaser images of the button festooned event and hopefully some chic ideas for you too! 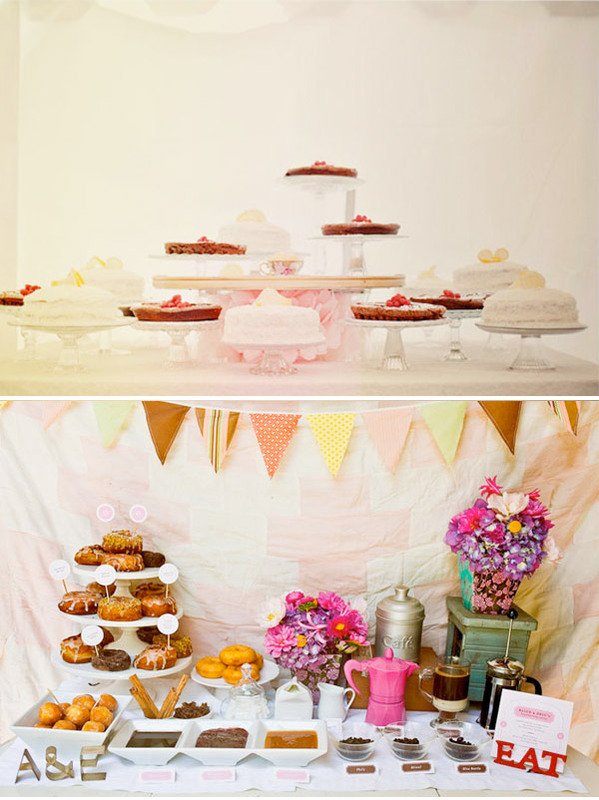 Head over to see the full Shabby Chic Bridal Shower post on Wedding Chicks. 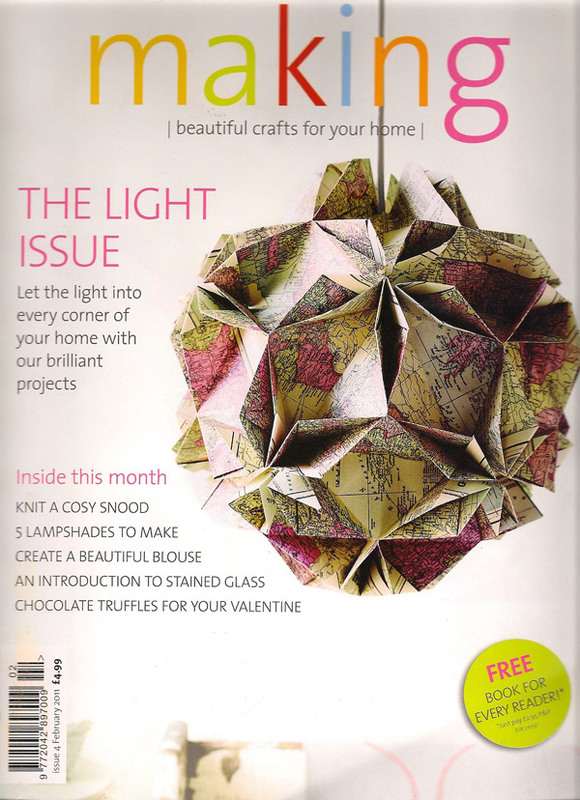 Have you found some inspiration in the DIY corner here today? PS! It’s something of an exciting weekend… we may just have a themed week coming up on Rock My Wedding. You know how we love a theme and we’ll be unveiling it complete with the usual wicked graphics sometime this weekend, so make sure you stop by and join in the excitement! Spurred on by the success of last weeks DIY Devotee, I wanted to share another yummy idea today which Charlotte spotted over on Something Old, Something New. These candy coloured cookies make perfect little messages for your guests, whether you choose to embellish them with your name and wedding date, a thank you or welcome message, or even naughty/nice wedding phrases to get guests talking they make perfectly sweet favours. 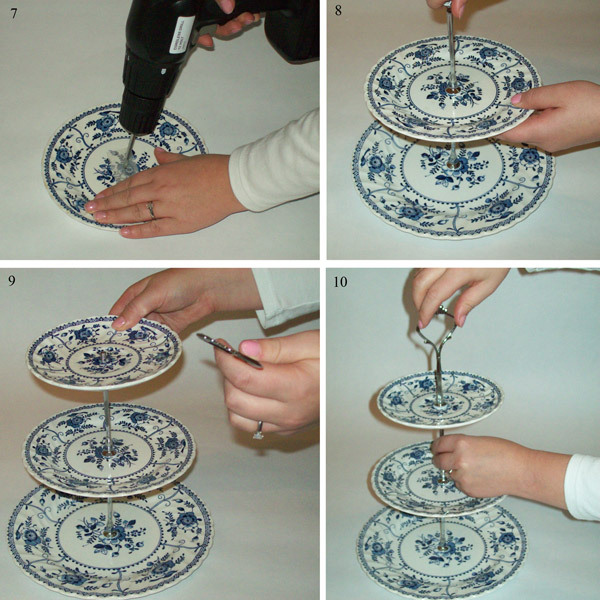 All you need is a bit of creativity and a piping bag! 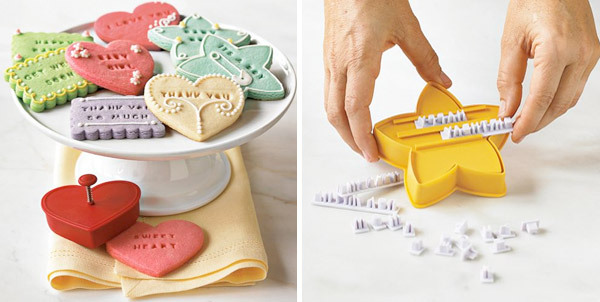 The message cookie cutter is available from Williams Sonoma for $19.95 and they do ship internationally, you just have to call them to set it up. 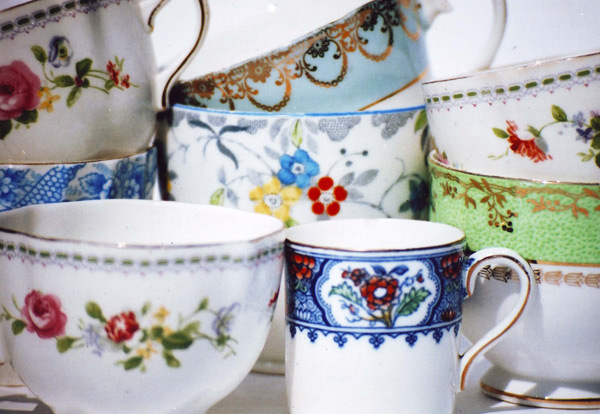 Our other share this week comes from Adelle over at Peonies and Pearls. 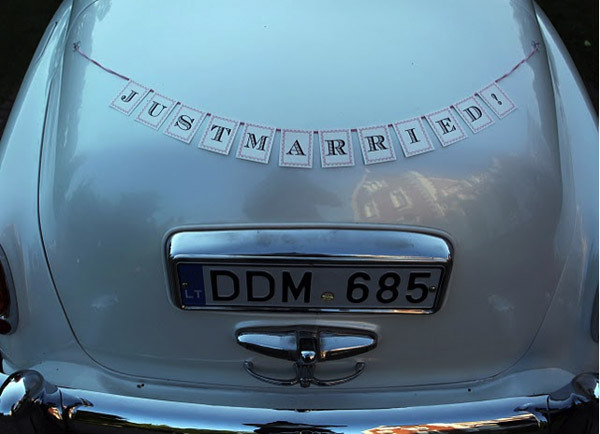 Adelle was sharing some of the clever DIY’s she did for her own wedding with us and I was particularly taken with this retro cute Just Married Banner. If you would like Adelle to share the template with you she used to make this cute banner (she also cleverly used it for a a Thank You card prop) there are full how-to details and her email address over on the blog post. 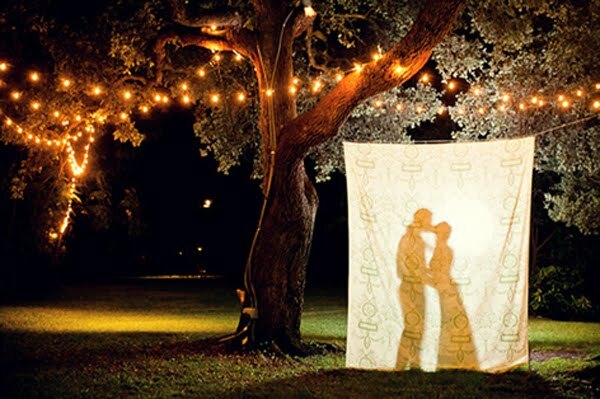 It’s kind of gone out of vogue now, but I love the idea of driving away earlier in the evening to spend a bit more energy than the usual collapsed state with your brand spanking new hubby and this would make a wicked photo op – even just from church to reception or photo location.